Hello, Welcome to my website and you can hear my interview with TV3 in Ireland about my Irish No 1 bestseller Still Waters and how I get my ideas for plots. 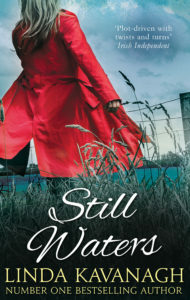 Still Waters has now been published by Harlequin Mira on December 1st 2014 in the UK, Australia and as an e-book. Still Waters reached Number 1 in Ireland last year and got great reviews, so fingers crossed! If you’d like to read the first two chapters, please click below. Linda Kavanagh is a former journalist who has worked for various Irish newspapers and magazines, where she was a feature writer, health and travel columnist for many years. She lives in Dun Laoghaire, Co. Dublin, Ireland. Her previous six novels are entitled Love Hurts, Love Child, Hush Hush, Time After Time, Never Say Goodbye and Still Waters, which were published by Poolbeg Press. The Secret Wife is now published by Harlequin Mira, and has been available in UK and Australian bookshops since September. All my novels so far have been in the ‘suspense’ genre – I love dealing with two periods of time, and bringing them together to finally explain the mystery that’s been surrounding the main character, and bringing all the strands together at the end. I think all my books have at least one murder in them, sometimes many more! I’ve been fortunate that my books have been successful in Ireland – all have been bestsellers, and two of them have reached Number One in the Irish book charts! Fingers crossed that UK and Australian readers will also enjoy the book, and that I might dare to hope for similar success with my overseas readers! I sincerely hope you enjoy The Secret Wife, and I’m always delighted to receive readers’ comments. The Secret Wife lulls the reader into a false sense of security with a seemingly innocent chicklit-style opening storyline but soon descends into a much darker and ominous tale of horror. Laura Thornton, an orphan heiress, is caught up in the excitement of preparing for her wedding to the handsome Jeff. It is obvious to everyone except the otherwise intelligent college lecturer Laura that the marriage is not going to work. Her best friend, Kerry, tries to warn her and is soon proved right when the cruel and possessive Jeff becomes violent. Laura’s life turns into a living hell after she leaves Jeff. He begins to stalk her and the police won’t believe her story. Even when she moves to another town, his menacing presence seems to be everywhere and, to cap it, friends start acting strangely. It seems the author’s particular brand of revenge is definitely best served very cold. As the past is gradually revealed, the present starts to make sense, though not without a couple of red herrings and the trademark twist or two.